Dombey and Son is a novel by Charles Dickens, which was published in serial form from 1846 to 1848. Paul Dombey is the wealthy owner of a shipping company. He dreams of passing his business on to his son. Dombey dotes on his son, and neglects and mistreats his daughter. The son is however incapable of assuming control of the business. The son is weak and sickly and does not socialize normally. Eventually he dies when only six years old. After the death of his son, Dombey pushes his daughter away, even as she tries to earn his love. Eventually Dombey remarries, to a woman that he essentially purchased from her father. The marriage is a loveless one and his new wife despises him. Eventually she runs away with Dombey's firm's manager, and Dombey once again characteristically blames his daughter whom he strikes, causing her to run away as well. Within a year of his wife and daughter's departure, Dombey's business collapses and Dombey ends up half mad, living alone in his decaying house. However all eventually ends well and Dombey is finally reconciled with his daughter. 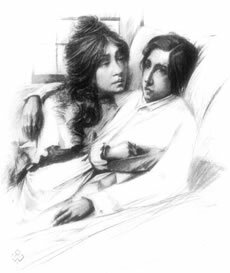 As with all of Dickens' novels, Dombey and Son deals with a number of social issues including the practice of arranged marriages for financial gain, and cruelty within the family. Paul Dombey's catchphrase "When found, make a note of", later became the motto of the literary publication Notes and Queries which was founded in 1849. Download full text of Dombey and Son.